Will Amazon's Kindle Fire Singe Apple's iPad? After months of rumours and speculations doing the rounds, Amazon's Tablet offering has finally hit the market. The latest device, codenamed Kindle Fire, has been launched by the company on September 28 and it is available for pre-order on Amazon's site at a price of $199. 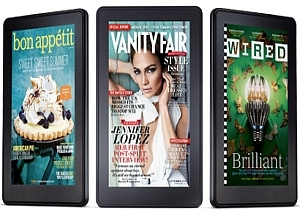 A message on the website reads: Our all-new Kindle Fire will be released on November 15, 2011. Orders are prioritized on a first-come, first-served basis. Ships from and sold by Amazon Digital Services, US only. But before you decide to grab the new kid on the block, let us have a look at the specifications. This Tablet comes with a 7 inch multi-touch display (1024x600 pixel resolution) with IPS (in-plane switching) technology and anti-reflective treatment. It runs on the Android operating system that has been especially customised for the Tablet (it will be interesting to see how it is different from Honeycomb or other Android OS) and is powered by a 1 GHz dual-core processor. That no physical controls have been provided on the front means the functions are completely touch-based. Additionally, Kindle Fire does not have a camera or a microphone and there is only 8 GB of internal storage available, which means users will have to be very selective while adding content to the Tablet if they do not want to run out of storage space. Moreover, the Tablet doesn't come with 3G, although it does have Wi-Fi and Amazon is providing users with free Cloud storage for all Amazon content (which is a good thing, considering the internal storage provided in the Tablet). Popular Android apps and games can also be accessed on the Tablet through the Amazon Android App store. The dimensions of the Tablet are 190mmx120mmx11.4mm and it weighs 413 gm. The device has a USB 2.0 port, a 3.5 mm stereo audio jack and according to the company, the Tablet will provide up to eight hours of continuous reading or 7.5 hours of video playback. It is black in colour and is currently available only in the USA. Before its launch, a major section of the media had stated that the new Tablet from Amazon might end up being an iPad killer. But in reality, it's nowhere near that and for a valid reason, too. Compared to Kindle Fire's 7 inch display, Apple's iPad 2 fares much better with a 9.7 inch screen, plus, the iPad comes with two cameras â€“ a rear camera that captures pictures (with 5x zoom) and records high definition (720p) videos up to 30 fps and a front-facing VGA camera. Also, the high-end model of the iPad comes with 3G (which is absent in Kindle Fire). The battery life of the iPad is also better and it comes with assisted GPS. Also, the iPad comes with 16, 32 and 64 GB of internal storage, which is much higher than the 8 GB that Kindle Fire is offering. However, the price of the Amazon Tablet is simply amazing â€“ it is $200 cheaper than the cheapest iPad and that may lure quite a few buyers. Having said that, we think Amazon never actually thought of the iPad as a direct competitor of Kindle Fire, to begin with. While Apple generates majority of its revenue from iPad sales, it may not be the same with Amazon and relevant content in the form of e-books, magazine subscriptions, streaming movies and an app store (among others) will be king. The low price of the Tablet and its dull specifications (in a time when superior Tablets are the in-thing) surely validate our claim. Should Indians Opt For It? As of now, there is no word about a launch outside the USA, let alone an Indian launch date or price. This means if you want to get your hands on a Kindle Fire, you will have to go all the way to the USA or ask your friends/family visiting or staying there to get you one. But is it worth the effort? According to CyberMedia Research, Indian customers are already spoilt for choice. In fact, there are 27 Tablet models available in India from 10 different vendors (this number can increase to 90 models from 35 vendors). And even though the Indian Tablet market is still not that big, almost 1.58 lakh media Tablets have been sold (shipped) during the nine months ended June 30, 2011, with the split between 3G and Wi-Fi models in the proportion of 70:30. This clearly shows that Indians want 3G and are not satisfied with just Wi-Fi, as offered by the Amazon Tablet. Additionally, in a market dominated by vendors like Samsung (it has 45.8 per cent market share in terms of unit shipments), RIM and Apple, how can the Amazon take over? The only areas where the Kindle Fire hits the jackpot are screen size and OS as the 7 inch screen and the Android OS are the most favoured in the country. But let us not forget that an Indian consumer won't be able to make full use of the added content services offered by Amazon until the company enters India and starts offering exclusive India-focused content. Until that happens, Indians should stick to feature-rich Tablets available here. They are in the same price range but are better than Kindle Fire and can be purchased right here in India. Some of the available options include iBall Slide for Rs 13,995, S Mobility's Mi-720 for Rs 11,990, Mercury mTab for Rs.9,499, Reliance 3G Tab for Rs 12,999 and Beetel Magiq for Rs 8,990. All the low-priced Tablets mentioned above come with a 7 inch screen and run on Android OS. But their similarities with the Kindle Fire end there. All these Tablets have cameras (for clicking pictures, capturing videos or video calling) and offer internal storage up to four times the storage available in Kindle Fire. Also, all of them either have 3G or can get 3G with the help of a 3G USB dongle. So skip the Fire, opt for a Magiq or a Slide instead.